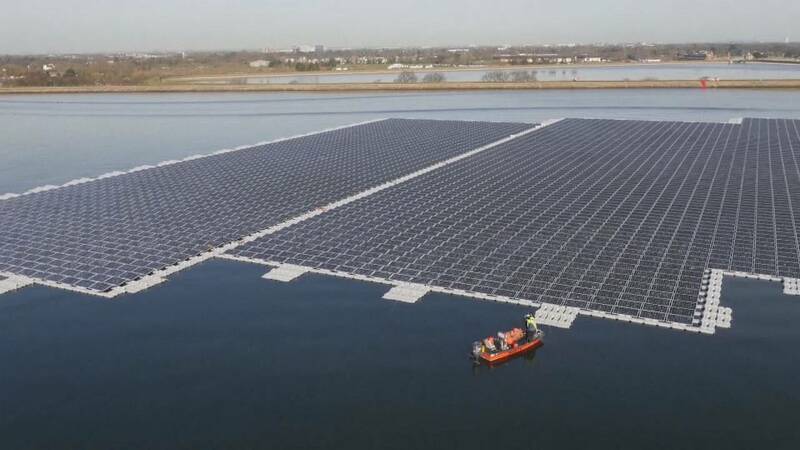 Europe’s largest floating solar farm is ready to switch on. Built on a reservoir, (the Queen Elizabeth II), near Heathrow airport in Britain, the solar array is to supply energy to a water treatment plant, the sort of facility that places a huge and often little-recognised drain on electricity. The farm, which is the size of eight football pitches, is expected to generate 5.8 million kilowatt hours of electricity per year. Solar panels are a great source of energy, but they do not allow for self-sufficiency in this case. “Solar energy doesn’t generate as a flat base load, it generates when the sun’s out. The demand of our water treatment works doesn’t go to zero at night and we have to pump water at night for example, so you could never get all the water treatment demand from solar installation. So it’s part of an overall strategy of multiple elements,” says Thames Water Energy manager Angus Berry. Each of the more than 23,000 panels is mounted onto an air-filled float. These are joined together to make rafts. Divers fixed 177 anchors to the bottom of the reservoir and cables carry the power ashore and onto the treatment centre a few kilometres away. Maintenance costs will be lower as the panels are more efficient on water because it is cooler. “Solar electricity and the panels and the wires work most efficiently whenever they are cool and one of the big advantages of having these floating on the reservoir is that you cool the wires and you cool the panels which actually means the solar plant itself is actually more efficient and produces more electricity than it would were it sat out in the middle of a field,“says the boss of Lightsource, the company paying for the project, Nick Boyle. The solar array will not connect to the National Grid but after testing is complete it will be attached to the private electrical grid at the water plant where it is expected to provide 20% of the plant’s electricity needs. A similar floating solar farm with around half the capacity of the Thames Water project is being built by water company United Utilities on a reservoir near Manchester. Construction of an even bigger farm – at 13.7MW more than twice the QEII farm – is underway on a reservoir in land-scarce Japan and due to finish in 2018.